Porto's Bakery amazes me. How is it possible that a place which operates like LAX with a crew of hundreds is able produce food that tastes like someone's dear abuelita made it with her bare hands? I'm talking about their savory house specialties in particular. Yes, they're masters of the baker's craft. There are cakes pretty enough to be featured on those ubiquitous Food Network shows about cakes. And their cheese rolls remain the benchmark to measure all cheese rolls, be it Cuban, Mexican, or Martian. But have you had their papa rellenas? Incredible! They are mashed potato balls gushing with spiced ground beef, breaded with a fine-grit crumb, then deep fried--a flavor fiesta in your mouth, if you can pardon my frivolous use of Spanish. The chicken empanadas crumble like savory shortbread cookies filled with meat. The chorizo pie is the ultimate Hot Pocket, with the notorious pork sausage as the ultimate filling. The ham croquettes are luscious pellets of porky paste. These are just a few of the items on the specialties menu. And I've tried them all. I'd recommend getting one of each, and sample the whole lot for lunch. One discovery you'll make will be the tamales. It is important, however, that you insist on getting it when it's fresh, right out of the steamer. If they offer you one that has sat around in their hot box, refuse it. Tell them you'll wait for a fresh piece; it's worth it. We pried our corn husk apart and the steam plume that escaped scalded our fingers. The contents inside was still practically liquid--a creamy, heavenly liquid you'll need a spoon to scoop. It's this cornmeal mush with bits of pork that will fill your senses with sweetness, an unequivocally great snack that will make you wish you ordered two more and wonder whose abuelita is working in the back. What you see above is a meal I eat weekly, but especially on the weekends when the Alberto's in Santa Ana offers a complimentary soda when you order this or any other form of solid food. In truth, I'd buy it even without the free drink. It is the half-carne asada nachos and it has everything I need: something crunchy, something creamy, something meaty, something cheesy, and something, um, guacamole-y. But as they say, variety is the spice of life, so sometimes I get adventurous. Sometimes I order the CHICKEN nachos. Yes. The chicken nachos. It is an off menu item, not unlike In-N-Out's Animal anything. It is what you think it is: they simply substitute the carne asada with the slow-cooked chicken they usually put on the enchiladas de pollo. What results is a different dish altogether. First of all, it feels immediately healthier, though really, it's not. It's all about the character of the chicken, which is so soft it can be spooned up like soup, and flavored just with a tinge of that seeped-in spicy simmering sauce. The meat does a Spock mind-meld thing with the rest of the components, combining into a wondrous slop that's more appropriate for a fork than fingers. No, it won't be a replacement of the carne asada for me. But it is yet another good variation of a bastardized dish that, according to legend, has its origins in the border town of Piedras Negras where it was purportedly invented by a man named Ignacio in the 1940s. What would the supposed inventor think of his dish now? I dunno, but if I were him I'd demand some royalties. Anyway. I digress. What follows is meant to be an informational essay for anyone who might want to try shabu shabu at home. If you count a goma grinder among your kitchen essentials, you need not read this. You're already an expert. But first this note: just because we are capable of making shabu shabu at home doesn’t mean that we’ve sworn off patronizing shabu shabu restaurants. We don’t speak in such absolutes. Still, it is significantly cheaper...even if you splurge on the Kobe cuts of meat. But more importantly, shabu shabu, because it’s so interactive, is actually the ideal dinner party food. You do, however, have to get over the hurdle of start-up costs. There are exactly two pieces of equipment that are required. The first is an induction stove. There are options other than induction. You could use Sterno or even a camp stove, for example. We would still recommend an induction. It’s safer and isn’t that much more in cost. Our local Costco recently had a sale on induction stoves for $49.99, which is a bargain when you consider other models can go upwards to $200. If you do buy an induction stove, the second piece of equipment you'll need is a stainless steel shabu shabu pot. Those aluminum pots you have at home won’t work on an induction burner. And most pots in a typical kitchen are too deep for shabu shabu. A shabu shabu pot needs to be shallow enough that you can lower your chopstick into it without scalding or singeing your hand. You can buy a shabu shabu pot from Amazon, but you’ll probably find the same brands for much cheaper at your local Chinese super market. 99 Ranch, our local Chinese grocer, had the one we now use on sale for $10. Skimmers and ladles are also nice to have, because there will be scum to skim and items that will be too slippery for chopsticks. Put them in a bowl of water next to the pots. After the hardware, the next thing you must consider are the ingredients. And if there's one rule, it's that there are no rules. There’s no right or wrong thing to put in shabu shabu. And there’s no technique involved except cutting a few ingredients up into bite-sized pieces. Again, what those ingredients are, is totally up to you. For us, it’s often what’s on sale at the local Asian grocery (in our case, HMart). Do pay attention to presentation, however. You could do family style, putting the things you’re going to boil in a big communal tray or in sharable saucers; but we like to individualize the plates to highlight the array of ingredients we’ve chosen. If you decide to do it this way, arrange the items with contrasting colors in mind. Imitation crab adds a splash of red. A green onion stalk laid atop something monochromatic like tofu can make it pop. If you do napa cabbage for your main vegetable (it's cheap and it cooks quickly), consider placing the greener leaves on top to highlight its color. We also find that oyster mushrooms work extremely well. Fish cakes and fish balls we add because, well, because we like them almost as much as the meat. And finally, there’s protein--which I suppose is the whole point of shabu shabu. But even here, it’s up to you. Pork, chicken, beef, lamb, they all work well so long as it’s sliced wafer thin. When picking out your meat (Korean or Japanese stores will have the best selection) make sure it’s sliced thin enough for shabu shabu. Be sure you're not buying the cuts designated for Korean BBQ, which will turn into leather when boiled. What you want for shabu shabu will often be labled “thin slice” or have some other sort of indication it’s been shaved expressly for shabu shabu. If you intend to add shrimp, like we did, you can completely peel and devein or leave the whole animal intact. Always segregate the raw meat from your vegetables and other pre-cooked items. Food illness by way of cross contamination isn't a way to win over your guests. When it comes to dipping sauce, we usually buy the ponzu and goma that are bottled for use on shabu shabu. They're usually about $5 a bottle. But we also offer the option of green onion, grated garlic and Huy Fong Food’s garlic chili paste for anyone who wants it. The sauces, by the way, are not optional. It will provide almost all the seasoning and flavor to everything you cook. After all, you are cooking things in plain water. Which brings me to the subject of the cooking broth. We opt for just water with some kombu. You could use chicken stock, if you want, but it'll be a waste. We'll occasionally add a little sake to the water, but have found that its flavor contribution is so insignificant we’re better off just drinking it. There’s no point seasoning the broth in any other way unless you intend to do Mongolian hot pot, which is an entirely different subject. Sometimes you'll see udon noodles being offered at shabu shabu restaurants for use after the meal winds down. But it's rare that that anyone we invite for shabu shabu ever wants the noodles. By the end we're usually too stuffed. One final touch that we added last time, which further brings home the point that shabu shabu at home can be just as good as those in restaurant, was a fake check we printed up to present to our guests. It was a joke. We all had a good laugh. And no, we didn't take their money...yet. There are Korean BBQ's everywhere these days. Shik Do Rak, Mo Ran Gak, Icheonwon, Go Goo Ryeo--these are just a few of the bigger players. Some do all-you-can-eat. Some don’t. All are there intent to stuff you full of beef, and pork, and chicken, or whatever else can conceivably be roasted and charred atop a table grill. If you don’t leave reeking of smoke and so overfed you feel like dying, you’ve done it all wrong. 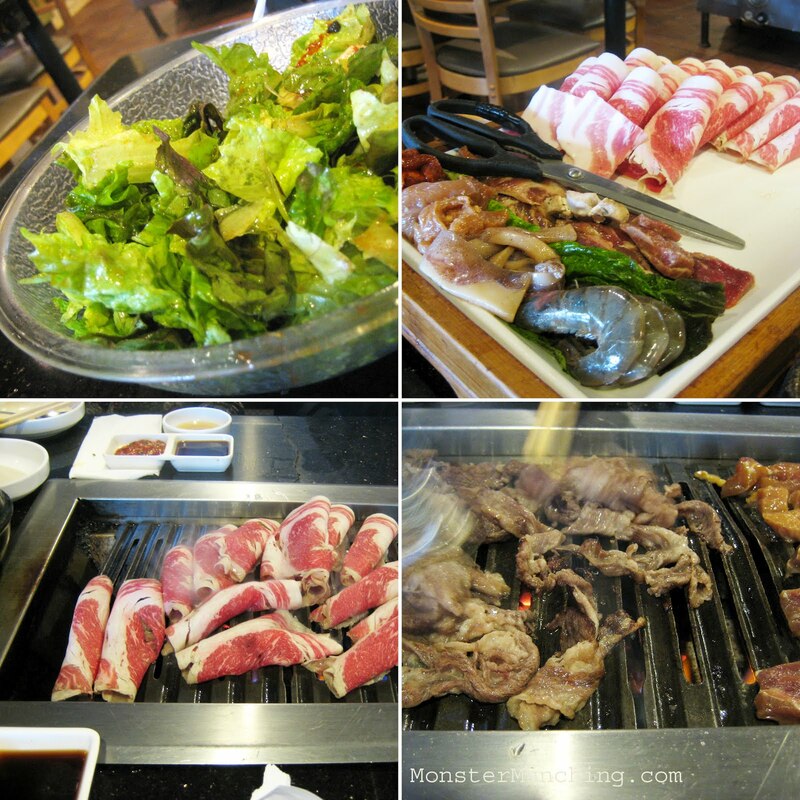 You need not go to LA’s Koreatown or Garden Grove’s Korean District to feast on KBBQ. On the Colima Rd. 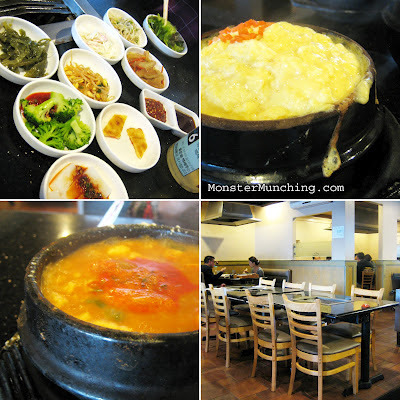 corridor in Rowland Heights, where a small Korean community has sprouted, Cham Soot Gol has to be one of the oldest, if not the oldest KBBQ joint in the neighborhood. It looks like the grand-aunt of all the others I’ve mentioned and it is related to the one in LA and the one in OC. The tables are worn; a few of the plates are warped from being too close to the heat; and the room is dark and dank, and not on purpose. The servers, by the way, will look like grand-aunts themselves. And for the first few minutes of service, before they attend to the other nieces and nephews, they’ll treat you like one of their own, snipping your kalbi into bite-sized pieces. This particular Cham Soot Gol is also one of the few places I’ve eaten Korean BBQ where actual charcoal is still employed. The one in Garden Grove stopped doing it a long time ago. Chunks of it are crammed just above the gas burners. That it adds a special smokiness to the meat (not to mention your clothes and hair follicles) should be obvious. Cham Soot Gol is an AYCE. You probably don’t need to order anything other than the cheapest option called the Special D which retails for $16.99 and gives you round after round of brisket, squid, chicken, shrimp, pork belly and spicy pork. The shrimp is particularly sweet; the thin-shaved brisket melts just like you expect it would. Here, like everywhere else, you wrap the finished morsels around squares of oiled noodle called dduk. 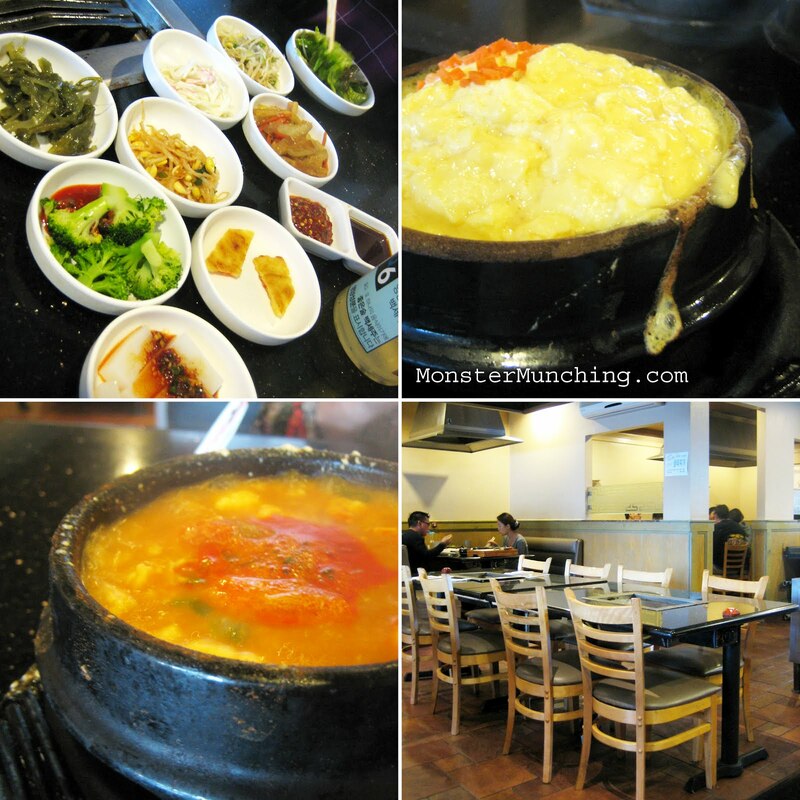 Included with all meals is salad, a good array of panchan dishes, a soondubu (soft tofu soup) and best of all, a fluffy, light as foam steamed egg that’s a signature of the Cham Soot Gol family of restaurants. Yes, the latter is filler designed to throttle your meat consumption so that you don’t eat them out of their profits; but have it anyway. It's good for you.